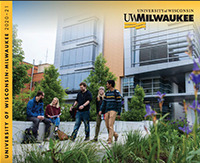 Explore Kenilworth Square East – a 6-floor, 500,000-square-foot, industrial artist studio space home to over 100 award-winning graduate students and faculty of UWM’s Peck School of the Arts. During KOS, studios open their doors and invite the community in to watch live art in the making. Guests will experience four hours of art exhibitions & film screenings; live music, theatre and dance performances; demonstrations and hands-on activities for all ages! The Innovation Studio Open Research Sessions provide enrolled participants access to the UWM Innovation Studio and equipment during scheduled weekly hours. This studio is NOT open to the general public and is for experienced fabricators who have had previous training in metal arts and are seeking studio access to help them make their own self-guided projects. The Jewelry & Metalsmithing Open Studio Program provides enrolled participants access to the UWM Jewelry & Metalsmithing studio and equipment during scheduled weekly hours. This program is only for experienced metalsmiths who have had previous training in metal arts and are seeking studio access to help them make their own self-guided projects. Jewelers and metalsmiths of all levels are invited to expand their skills with the exciting and challenging summer intensive workshops at the University of Wisconsin-Milwaukee. Investigate a variety of techniques and processes and learn new ways to solve problems in metal while exploring your creative potential. A one-day, immersive workshop where colleagues from the field of Dance will participate in classes specially designed for educators. Workshops include Somatically Informed Ballet, Laban Movement Analysis for Young Dancers, and Composition. Join double reed faculty and fellow players for a day of master classes, workshops and faculty/ensemble performances. Open to all ages & levels. A survey course in finger-style guitar that features both lectures and multimedia presentations, as well as applied instrument instruction on finger-style guitar technique and repertoire. We welcome anyone interested to sign up, and have designed the performance requirements of the class to accommodate students at a variety of levels. Join us for a day of classes, workshops and performances featuring UWM faculty, students, and alumni. The day concludes with a recital of UWM faculty, students and alumni. Junior High and High School students may audition for a performance slot on the concluding recital. Gather with voice teachers, professional singers, future teachers of singing, and choral directors to learn about training the “versatile voice” to perform musical theatre, classical, contemporary pop music, and more. In this intensive three-day workshop, intermediate guitar students will have an opportunity to work on three compositions by guitarist/composer Leo Kottke. Archival video, enhanced computer capabilities, and specifically designed pedagogical materials will enable participants to study these pieces in depth. This class also includes multimedia lecture/presentations on the background, career, compositions, and technique of Leo Kottke, featuring rare archival video of Leo Kottke discussing composition, performance, and a life devoted to music. Join UWM piano faculty members for a festive day celebrating Mozart’s keyboard genius! The event will focus on an in-depth exploration of Mozart’s piano music. Festival sessions will touch on style and interpretation in performance and pedagogy, and will include informative workshops, panel discussions, masterclasses, and more. The University Community Band (UCB) is a concert band open to community members ages 18+ and students at the University of Wisconsin-Milwaukee. This ensemble invites advanced beginners to skilled amateurs, ages 12 and older, to rehearse and perform together. It is open to anyone who can read music and enjoys playing classical symphonic repertoire.